The reemergence of the American muscle car is one of the most exciting things to happen to the American automotive industry in decades. While many Americans still favor economical, fuel-efficient vehicles, some drivers just want something to turn heads and push their body into the seat when they hit the accelerator. That’s just what Dodge has done with the Challenger SRT Hellcat. With a ferocious name, sporty styling, and a beast of an engine, it’s hardly debatable that the speed freak needs this car. Here are just a few more reasons why buying this car is the smartest decision you’ll ever make. Although Chrysler-Dodge makes several Hemi engines, no other is like the Hellcat’s. It shares the engine in name only, featuring 90 percent new components compared to the 5.7-liter and 6.2-liter options. When you pop the hood you’ll gaze upon what is perhaps the best example of modern American engineering. This engine is a massive 6.2-liter Hemi supercharged V8. With this behemoth, the Hellcat pushes 707-horsepower and 650 pound-feet of torque and is almost unrivaled by anything else on the market. Once you’ve inspected the engine and wiped off your drool, it’s time to head into the cockpit and give this monster a test drive. The Hellcat comes with two transmission options: a six-speed manual or an eight-speed automatic. Either way, this baby cooks. With the automatic, you’ll fly off the line like a jet as this transmission boasts a zero-to-60 time of just 3.6 seconds. Driving enthusiasts may like the feel of a stick better, but, although it’s a bit slower, the manual version still goes zero-to-60 in a mind-bending 3.9 seconds. You may also notice that the speedometer goes to 200 miles per hour (mph), and that’s not just for show. Test drives conclude that the Hellcat is fully capable of reaching at least 199 mph, meaning you’ll need to find a track or a cop-free straightaway to really feel all it has to offer. With a price tag of just over $64,000, you better believe the Hellcat isn’t just a stripped down muscle car. Inside its opulence is like a luxury vehicle’s. The seating is surprisingly comfortable thanks to its leather construction, and heated seats are a nice bonus. Other comfort features include heated steering wheel, ventilated seats, solar glass, and a leather-wrapped steering wheel. It also seats five passengers relatively comfortably and comes with 60/40 fold-down rear seats to pack in whatever you might want. The interior features don’t just end with comfort and convenience. They’re supplemented by several technological features like an 8.4-inch touchscreen display, GPS Navigation, HD Radio, SiriusXM satellite radio, and Uconnect Access, which allows you to sync your mobile phone to the head unit. 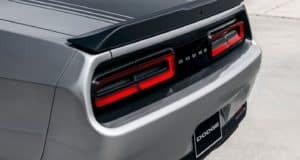 If you’re an audiophile or just want to hear some AC/DC at blaring decibels as you cruise down the road, the Hellcat sports an 18-speaker premium audio system with two (that’s right, two) subwoofers. Not even luxury cars or after-market systems can boast that. If these details haven’t convinced you to buy or at least consider the Hellcat for your next vehicle, then you may need some professional help. Or you can simply come to terms with your insatiable love for this car. Either way, each scenario should end with you in the Hellcat.